Florida’s Melbourne-Tillman Water Control District (MTWCD) includes levees to protect the area from flooding by the Upper St. Johns River (USJR), and a canal network to improve drainage. The main canal for this drainage network directed storm runoff from the MTWCD into Turkey Creek towards the Indian River Lagoon (IRL) estuary. The reduced freshwater flow in the USJR reduced the water supply available for downstream users. And the increased storm-related freshwater discharge into the IRL periodically depressed salinity below desirable levels for prolonged periods, producing increased stress on the IRL estuary ecosystem. The associated pollution attenuated light penetration into the water column and limited the coverage and density of sea grass habitat. In 2010, the St. Johns River Water Management District (SJRWMD) of northeast Florida sponsored drainage modifications for the MTWCD in efforts to reduce the runoff from their fresh water drainage system into the IRL. The SJRWMD replaced the aged gate system to divert some water that used to go east into Turkey Creek and send it west to be pumped toward the USJR. The six new gates are fully automated, controlled by a bank of four Campbell Scientific CR1000 dataloggers. Using LoggerNet software, the dataloggers are programmed to measure twin water-level sensors upstream and a single sensor downstream of the gates. The software is installed on computers in the MTWCD and SJRWMD office, and is also installed on a SJRWMD laptop computer, giving managers the flexibility to control the gates from any location. Two cameras are positioned to view the gates, and they interface with the dataloggers and software to enable remote viewing of the site. The Campbell Scientific equipment runs in automatic mode for most flow and flood control situations, with minimal need for staff intervention. All operations of the gates are monitored by the equipment: every water level, all six gate positions, rainfall, and other elements. The LoggerNet software also continuously calculates and reports the discharges flowing over the gates. Two basic operational regimes have been programmed into the controlling dataloggers: gate control and flow control. With gate control, an operator can set any of the six gates at any elevation, where they will stay until moved again. In flow control, the operator will specify any flow value, say 575 cubic feet per second (cfs). Because the LoggerNet system constantly calculates the gate flows, this operational regime allows the dataloggers to physically move the gates based upon the desired flows. The option to override and go into manual operation is available whenever managers need it. With these flow controls, the system limits discharges from the C-1 canal into Turkey Creek, no matter what the upstream water levels are. Emergency conditions are accounted for and the system is programmed to handle tropical storm and hurricane conditions when initiated by an operator. In these modes the gates are incrementally opened through any countdown desired (typically 72 hours) to allow more flow through as a tropical storm or hurricane advances to the area. After the storm threat has passed, or at any point in the countdown, the system can be switched back to automatic flood-control mode. The main advantages of all the gate and operational modifications include the ability to raise the level of the upstream canal to divert water as needed, and the discharging waters that pass over the gates are more advantageous upper-level water that has a higher oxygen content than the lower-level water the other styles of gates discharged (for better water quality in Turkey Creek). 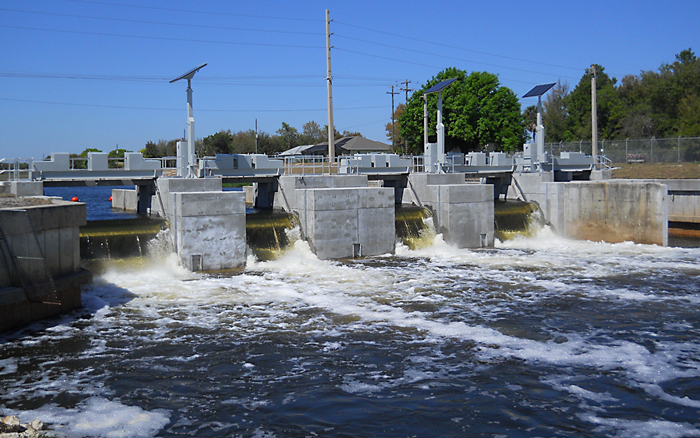 These overshot gates also reduce sediment transport and turbidity in the discharge water. All these improvements obtain the ultimate goal of reducing fresh water discharge into the IRL estuary, resulting in the reduction of nutrients and other pollution into the Indian River Lagoon.